Accepta 7141 is a high performance, eco-friendly biological drain cleaner, scientifically formulated for the cleaning, control and removal of fats, oils and grease from grease traps, drains and sewers. Accepta 7141 is a highly effective natural biological cleaner specially developed to enhance the maintenance of grease traps and drains. Accepta 7141 offers the perfect solution to those drainage problems caused by the build-up of grease, oil and fat in commercial kitchens and restaurants. Pouring harsh caustic chemical cleaners or acids down the drain to clear unwanted obstructions can no longer be guaranteed to solve the problem. Not only is it dangerous for both the user and the environment, it can also be detrimental to the existing plumbing, drain-lines and drainage installations. Accepta 7141 is suitable for drainage systems incorporating grease traps and/or pumping stations en-route to a treatment plant or main sewer. This high performance biological liquid is dosed daily into the drainage system.At the end of each working day a pre-determined volume of product is automatically dispensed into thedrainage system by a timed peristaltic pump. The environmentally friendly microbial technology liquid then converts grease intocarbon dioxide and water, and more microbes! The installation of the automatic dosing system is simple, requiring only a 5 amp electrical supply. Accepta 7141 is able to remove fat and grease deposits because it contains millions of naturally occurringmicroorganisms, which degrade fats and grease overnight to leave the drainage system flowing and odour free. Accepta 7141 also optimises the performance of treatment plants and enhances the quality of effluent. 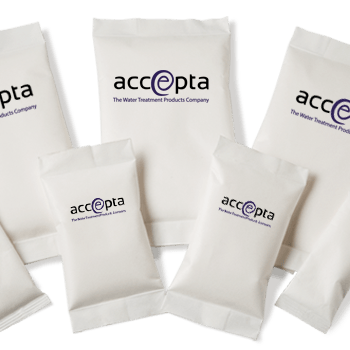 Regular treatment with Accepta 7141 can reduce the Biological Oxygen Demand (BOD), Chemical Oxygen Demand (COD) and the Total Suspended Solids (TSS). To use Accepta 7141 always empty grease trap prior to treatment. Seeding – Initial dosage to be added directly into the trap. Maintenance dosage – Daily dosage to be added into the drain lines upstream. Seeding – 1.5 litres/m3 (volume of grease trap). We recommend that this product is used in conjunction with an Accepta automatic dosing unit. Accepta 7141 should be fed into the lines 2 hours after the end of the working day. Dosage rate of Accepta 7141 to be increased for larger drain lines and extended pipe length.